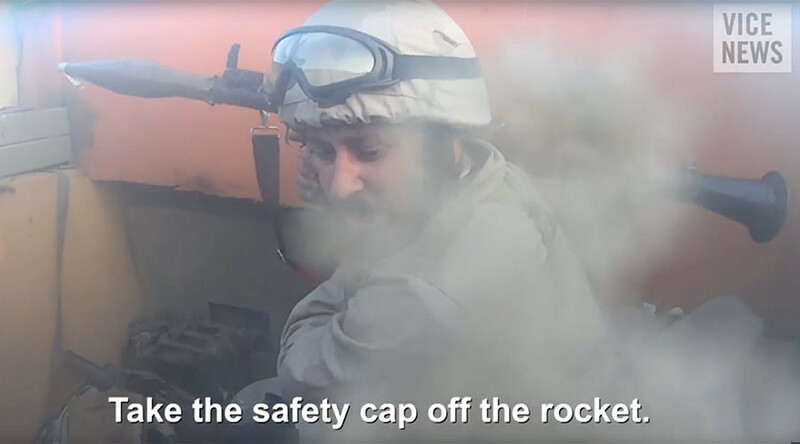 In stark contrast to glossy ISIS propaganda, a video filmed by a terrorist’s helmet camera during his final battle with Kurdish Peshmerga troops near the Iraqi city of Mosul, demonstrates chaos and panic running through the ranks of the terrorists. The video was obtained by Vice News who say it comes from a clash that took place 30 miles north of Mosul in March 2016, although no exact date has been specified. While the fighters seem pretty confident in their improvised armored vehicle early on, the sense of courage soon dissipates and panic sets in as they try to fire their weapons and find their ammunition. The men seemed particularly angered with one of their own fighters named “Abu Hajaar,” who kept complicating the remainder of his terrorist comrades’ lives. The men are seen ducking for cover within their truck while they scramble for their weapons with one man shown to be firing a rocket into the distance. “Good job, but you roasted us too,” says one of the men. The arguing then continues with Abu Hajaar again taking the brunt of it after hitting one of the others. “What’s wrong with you, Abu Hajaar?” one of the men shouts. As the shooting continues and the vehicle falls under fire, the men try and fire a second rocket but struggle to find one that fits the barrel. The terrorists are eventually forced to leave the vehicle after it is struck by a Kurdish rocket which also killed the driver. As they retreat, the man wearing the headcam is shot and is heard screaming as he hits the ground. The man continues to fire more bullets as he tries to shield himself by rolling away. The video concludes shortly afterwards, as well as the terrorist’s life, apparently.